+ How to Install ? Recently, Blogger launched the much awaited Blogger Pages Feature. 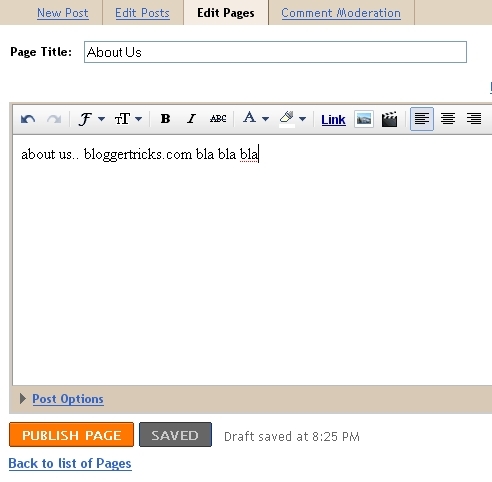 So, lets see how to Create Static Pages in Blogger. 2. Click on New Post as usual. 4. Click on 'New Page' button. 5. Now, give your page a title and write the content and publish the page. 6. 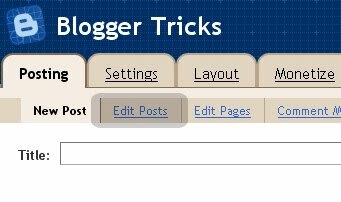 If you want to display the Pages list in your Blog sidebar, select the 'Blog Sidebar' option,or you can keep it as nav menu below header by selecting 'Blog Tabs' option. 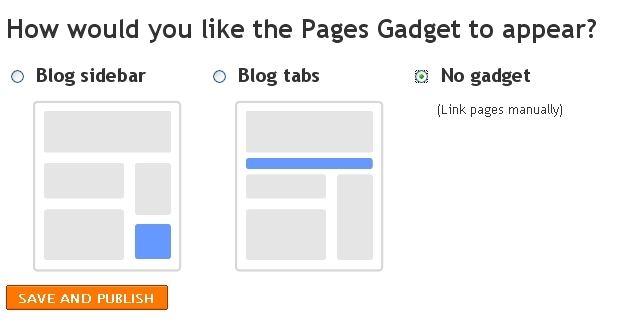 Note: If You've Selected either 'Blog Sidebar' or ' Blog Tabs ' option and if you see any bx-error,.. then, come back to last page and select 'No Gadget' option. This means,you have to add the links manually to your template. Click on Edit Pages again and Right Click on View -> Copy link location (in firefox) and Add the link manually in your sidebar via Link widget or you can add the link in your navigation bar via template > edit html. where can i find the blogger side bar and blog tabs option? I've also written the post on the same topic..!! But you have given better tutorial than i've :) to be honest...anyways it was good visitn u...keep in touch!! Thanks for this. I do have a question though. Is it only for a single post? How can you add posts to the second page? Your blog is awesome! I was so excited to hear Blogger has added this feature, but I don't have the Edit Pages or New Page Button on my blog. Why can't I see them at my blog? Nevermind! I realize now that I was in my regular Dashboard, not Blogger Draft!! I can see it now. Thanks again and I'm adding your site to my blog roll. It's a shame we're only allowed 10 different pages, wish Google would offer us more than that. I hacked the 10 Page limit, the first day Blogger posted this new feature, on their blog. I have a test blog that has 14 of the new Blogger Pages, I only posted 14 because I got tired of creating new pages, lol. Wah wah..!! How mate.. ? Wow.. Very good job mate.. I updated the post with your link. I'll have to wait to see how Blooger deals with the New Static Pages (long term) once they release the Page option from Blogger Draft, to the regular Blogger Dashboard. Good post. It was long time you haven't post. Right? Thank you! I was just thinking about how I'd solve the lack of static pages problem. This helped me so much. I recommend manual linking, though. The 'blog tabs' navbar isn't customisable as far as I can see (except for link order) and looks weird on some backgrounds. Thanks for this. Good post. Hi there i am going to start a new website for that content can u suggest me anything for that . Thanks! Glad I found you! Question--Can you make a page that will have all of your posts with a certain label? Such as "projects"? Hi, please excus may poor english! I wanto to use yor Schemer Mag Template, but it had some problems, acording to some comments on that post, pleae tell me if those problems have been solved? Thank you very much, yor Schemer Template es just beautiful and I really want to put it on my blog! 1. This is really great and all but when you go to the post page, the picture is still a thumbnail. How to fix? Is there a fix for this or a way I can craft my posts so that this doesn't occur? 4. I am so glad to had this template. but still i have some problems with the images in post. inside the posts, when i adding the new images it final result is showing thumbnail side. But my old Posts still showing same size. 5. How can I place and Add This/ Share This button onto the body of the post? 6. Also is there a way to add a date / time stamp to the posts on the home page and the post body page? 7. date is not showing up and is there a way to show ads after a posts title.the trick yiu mentioned here http://bloggertricks.com/2007/12/placing-adsense-ads-inside-or-between.html is also not working. 8. Template looks very cool But having problems with IE7. I checked with firefox, chrome, opera and safari and there are no problems. wow! finally. thanks for this great info. kranthi,i need your help,how to show "author" and "date post" on schemer mag templates ? Please help . Static pages are a useful feature no doubt! The static pages will not be used as posts, so they should not appear in your RSS feed. Also, comments for static pages aren't needed, in my opinion. Thanks for ignoring my question,forget about that,i'll find by myself. I desperately need help with the turn out mag template. i've been using it since december and all of a sudden it doesn't view properly in internet explorer 7. is there anything you can do to help? sorry mate.. actually... i've very busy with my studies now..that's y not replying to messages..
For all Ppl,... for the next three months, if you have any question PLEASE ask in the blogger forum (forum.bloggertricks.com)..So, someone will help you out..
is there a way to make one of those static pages your home page and place a link in it to the actual blog? thanks! Does anyone know if it's possible to re-direct a "pages" button to a hyperlink? All this is fine, i'll create pages but how i can add them to my blogs first home page. Like a tab of 'Home' , 'About us' , 'Contact us' ?? I was able to add 2 pages to my blog now i get errors when trying to add another. the error code is bx-w828o1. does anyone know how to fix this? I really want this fixed asap as im trying to launch this weekend. i like it !!!!!!!!!!!!!!!!!!!!! thankzzzzz a looootttttttttttttt!!!!!!!!!!!!!!!! Wow! How fast Google Crawling this site!! less than a min! Adsense Inside or Between blog posts.. learn how..
How to add different meta tags to different Blog posts ? 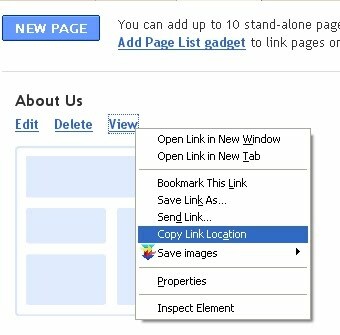 Want to disable right click in your blog?Find out how..
Free tool to add adsense inside posts..